One of the best things about being a journalist is the fantastic opportunities you get to walk in other people’s shoes. Whether it’s joining police dog handlers on a busy shift or MPs in the Houses of Parliament, riding in the cab of a train or talking to Bomber Command veterans, our chosen careers have given us some wonderful insights over the years. These days we’re more often or not a fixture behind a computer doing all those tasks you need to do to keep a company running, as well as looking after our clients and keeping our own websites up to speed. Which makes the chances to get out with a notebook and pen all the more valuable. So, when we were invited to drive down to Horley in Sussex for the launch of Puretech Racing’s new simulator centre, we only had to think about it for around 30 seconds before agreeing. And 29 of them were spent wondering about the route. We had a great day meeting the people behind the project, which aims to create a new fan-friendly sport allowing participants to race against each other, form teams and leagues, and generally get much more closely involved in motorsport than has hitherto been possible without a massive commitment of time and resources. Also present were some of the racing drivers that use Puretech’s simulation technology to work on set-up, learn new tracks or hone specific skills. 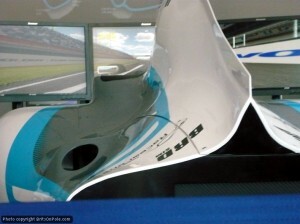 As well as chatting to them we tried the simulators for ourselves. Although with considerably less effective results. We covered the experience in some detail on our racing site Brits on Pole – you can find links to all our coverage here. We hope you enjoyed reading about it as much as we enjoyed getting out of the office and reporting on it. Filed under Events and happenings, Things we've done and tagged with British motorsport, Puretech racing.